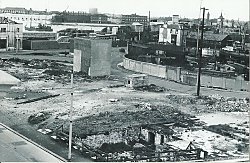 The following (edited) article by Keith Feltham was first published by the Friends of Old Portsmouth Association in their Newsletter No. 21 in 2007. We are indebted to FOOPA for permission to re-publish on this site. No. 4 Broad Street was the home of my grandparents and where my grandfather, George Feltham, had his boat-building business, G.A. Feltham and Sons, in the workshop behind the house. From my earliest memories, everyone was always welcome and the back door was never locked. The front door was seldom used and anyone who visited, whether it was the milkman or a potential client wanting a boat built, came in by the side passage, through the scullery and into the kitchen/dining room. Far more casual and easy going than these days. 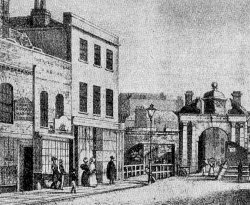 An early sketch of the old Point Gate shows the house with a shop front at ground floor level with the sash windows to the first and second floors being divided with glazing bars in true Georgian fashion, as was the shop window. A panoramic sketch made from the top of the semaphore on the Square Tower by Commander Smyth in 1826, seems to indicate that the shop window had, by then, been replaced by two separate windows and an entrance door. There was always a step down from the entrance passage into the two main rooms at ground floor level which was presumably the area of the shop. The sashes to the windows subsequently lost their glazing bars, probably in Victorian times, and the entrance door and two windows in lieu of the shop window gave the house a very plain and austere appearance with no decoration or features on the front elevation to relieve it. In my grandparents' day, the ground floor consisted of a front sitting room and behind this was a room which served as a small workshop, mainly for the fashioning of metal fittings for the boats, and behind this again was the kitchen/dining room which had access from a scullery with the back entrance through an area with a glazed roof. This last area was a convenient space for depositing the fish after a nighttime trawling session or a day of line fishing. Many is the time that I found several lobsters languishing on the stone paving prior to being cooked by boiling in the copper in the scullery. The kitchen in the fifties had a black iron range set in a large fireplace which kept the room cosy in the winter months. When the range was taken out and a modern tiled fireplace was installed, although more convenient, the room was never as warm again in the cold weather. At mezzanine level off the stair landing was the bathroom with a fine old bathroom suite panelled in mahogany for which any architectural salvage company would, these days, give a small fortune. However times were different in the years after the war and this was sacrificed in the name of modernisation and hygiene. At first floor level was the principle bedroom with a bay window on the side of the house and across the front of the building was one large room which at one time contained a billiard table. 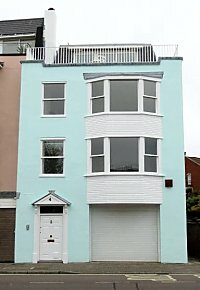 The top floor had four or five bedrooms which would, no doubt, have been used to capacity with a large family of five boys and a girl to accommodate. 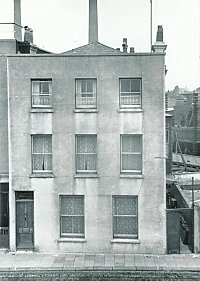 Records show that the house and, presumably also the workshop, was occupied in 1830 by Robert Hatch who is described as 'ironmonger' and in later years he expanded his interests so that 'packet office' was added to the description and subsequently he became agent to Atlas Life & Fire and to the Consolidated Investment & Insurance Company. However by 1879 he seems to have moved to 10 Broad Street as a 'shipping agent'. In 1888, John Read, a boat builder, had No 4 as well as No 2 Broad Street (this latter property, which has long since disappeared, was previously The Albert Tavern). In 1898 Robert Curtis had taken over No 4 and John Read had No 2. It is interesting to note that in 1871, John Read had two addresses recorded — 'Camber Slip' and 10 St Thomas's Street and is described as 'shipbuilder', presumably the precursor to Vosper's Shipbuilders. It is also noted that, in 1911/12 John Read still had No 2, while William Read was living at No 4. The house is described as a private residence from about 1898 and was the home of a Miss Bond from 1899 to 1910/11 when William Read took it over for a short while until Edward Ranken moved in during 1914 or 15. My grandfather had acquired the property by 1918 and the workshop again became used for boat building until his death (and on the retirement of my father) in 1975 when the property was sold. Considerable alterations were then carried out which included forming a garage at ground floor level, the installation of bay windows on the front elevation and a further floor being added under a mansard roof as well as internal alterations, all of which were a considerable improvement both to the living accommodation and visually, although I have little doubt that this work would not meet with approval from the planners or - dare I say it - FOOPA if it had been proposed thirty years later. The living rooms are now on the top two floors with a delightful roof terrace with magnificent views across the Solent to the Isle of Wight. Since 1975 occupation of the house was subject to regular changes until Fiona Edgley bought it in the year 1999. Fiona used the house to its full advantage and gave the impression of enjoying living there with all the facilities it then offered which were well suited to her artistic pursuits.